The first thing you will notice about Diner is that the lineup starts even before the doors open. The exterior looks unimpressive because it’s like an old wooden structure but when you get inside you will be impressed by the tiles on the inside the banquette seats with the the long bar; it just has that old style that you just don’t find anymore. I should note that the washrooms are kind of snug so if you like space, good luck. The interior itself is dark and we had the side dining room in the back, which is even darker, so the pictures of the food are not amazing. Still, with those seemingly negative points, this place is fantastic! The vibe, the feel, the food – everything comes together here for a unique experience. I have followed the web site since I was there and the menu does change so what I review may not be there when you go. The menu is pretty simple with less than a dozen items on it and the staff will let you know about the daily items when you are ready to order. In fact, our waitress wrote on our paper table cloth so we were able to look at the cheat sheet in case we forgot what there was. The menu itself is a little more salty than sweet, but that does not mean there are no sweet options. Now we were 2 large groups. We were supposed to be 1 group but after a night of excessive partying, not all of us were able to make it at the time we had hoped for. So, we have some items photographed and other items are second hand information. The menu itself had items priced between $10-$14; coffee was $2.00 with free refills; sides dishes were $3-$5. Even before we started eating, they brought some mini pancakes on the table for all of us to share. 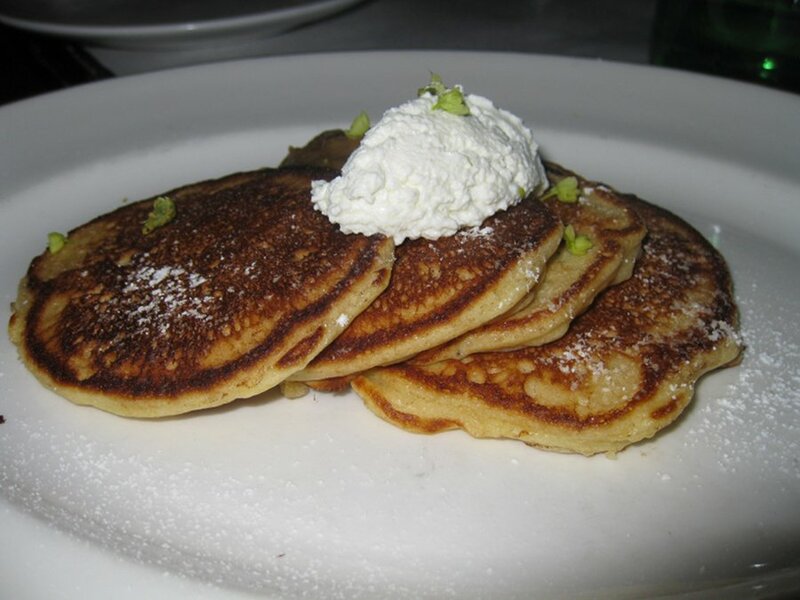 The pancakes were topped with a dollop of cream and were nice and fluffy, while at the same time not soggy. This was a nice little treat to offer as a bonus to the meal. One of our main dishes was two poached eggs with arugula salad and a baguette bread ($11). The egg component was very tasty and although the picture does not make the portion size look large, it was plentiful and filling. The bread on the side was a nice touch and although I find salad in a morning dish unnecessary, the arugula salad did add a little to the dish and made it work. 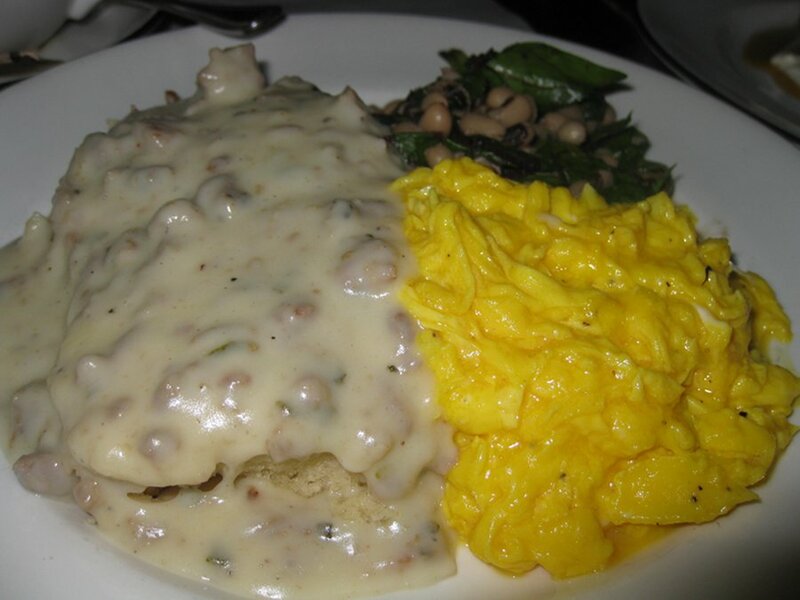 The Country Breakfast ($13) is comprised of scrambled eggs, biscuit with sausage gravy, kale, and black eyed peas. Although it looks very simple, the taste is anything but. This was my favourite dish, hands down. It was a veritable taste explosion with the eggs, sausage gravy and beans working in unison to give a hearty and filling dish. The biscuit on the bottom is a great idea since it supports the liquidness of the gravy and helps bring it all together making each bite unforgettable. 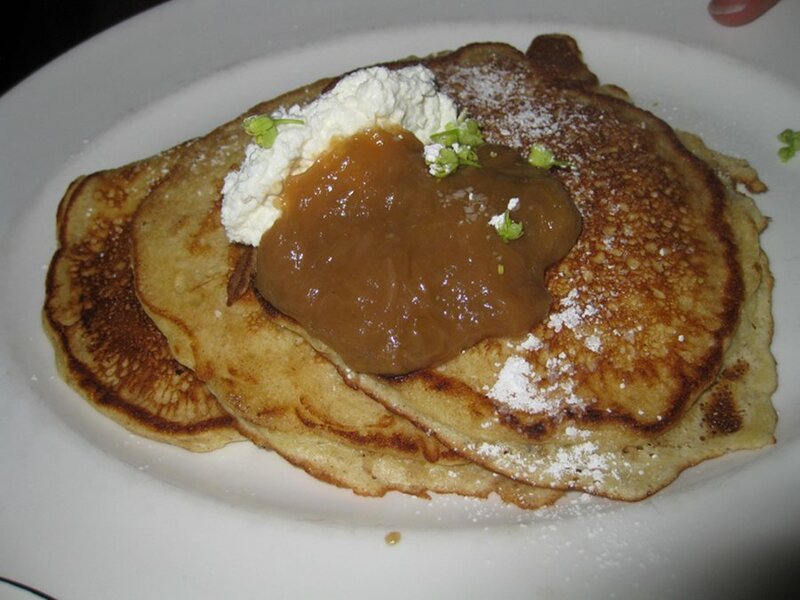 We then moved onto the Pancakes ($11) that had rhubarb compote, mint and were topped with powdered sugar. The pancakes were similar to the ones we had as the free appetizer but they were much larger and quite filling. I love the fact they use rhubarb although one would not expect to see it on your morning plate. It works so well and the toppings were so tasty and helped solidify this as a standout dish. 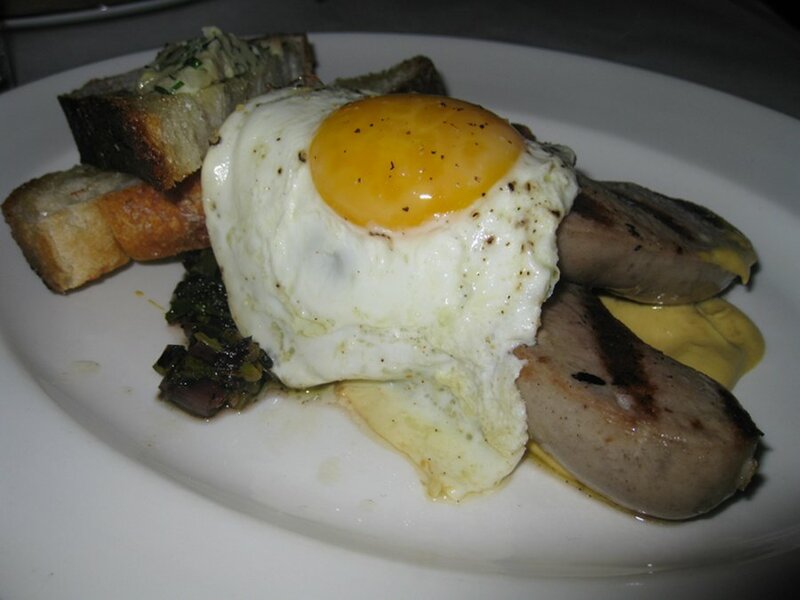 Other dishes of interest were the Bratwurst ($11) which had two sausages with eggs, bread and some greens. This dish is not overly breakfasty, but it will definitely fill you up and make your taste buds go on the ride of a lifetime. If you look at the price and the meal size, it’s actually quite a good deal. There was a ham dish ($9) which I ordered out of curiosity and was quite pleased. 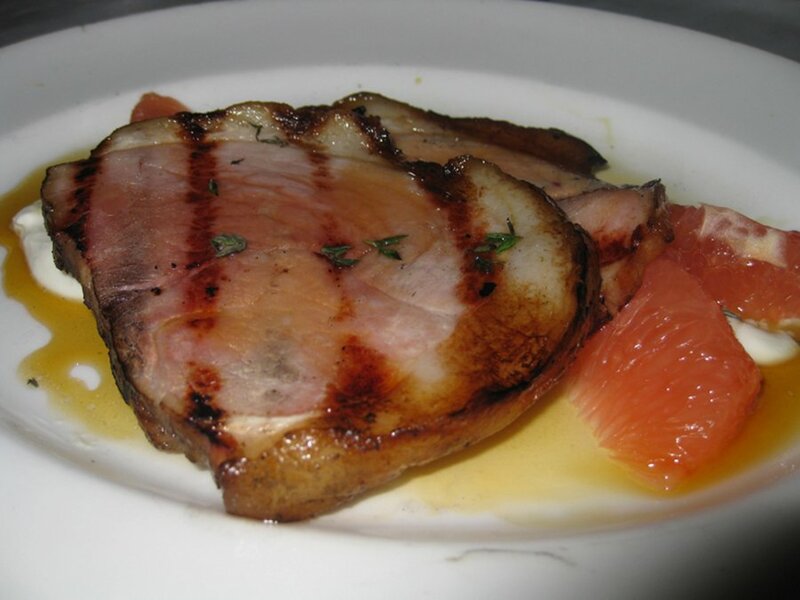 The dish did not have much on the side but the ham was thick, juicy and tasty. I would have preferred a little more on the side, as usual. Another item which I did not get to sample, but others did, was the 5 egg omelette, which by all accounts was spectacular and people still rave about even a month later. I left my home fries loving heart in Williamsburg. Who would have thought that out of all the places that had my favourite side dish, I would find it here – in a renovated / rundown caboose. The potatoes were hand-chopped and perfectly freshly fried – not too crispy and not too raw. Considering the location, I believe that the potatoes were organic and, if it were possible, they were free-range and not frozen like local restaurateurs continuously opt for. The spices lightly seasoned the potato and green shallot mélange. But, what makes them the best is the potato skin left on the home fries. The crispy potato skin adds a contrasting flavor to the bare potato texture and augments the experience overall. I didn’t even think of asking for any condiments. I give this hefty portion of side home potatoes a 4.5 out of 5. It is the highest I will ever rank since I do not believe in perfection. Service was unique in that we could not be seated until all of us were present. So, naturally we lied and said that we were all there and just as 2 other people magically appeared so too did 2 free spots. Our waitress did not waste any time telling us what was on the dish and even wrote it on the paper table cloth which was genius since the off-menu items could now be reviewed even when she was gone. Coffee refills were not the easiest to get but it was an experience. There are some vegetarian options here but I did not find any vegan ones on the menu. I should note that if you are looking for a healthy/cottage cheese and fruit options, you may not get it here since the dishes can best be described as country/comfort food. This was definitely the culinary highlight of my New York Brunch tour. The décor, the food and the experience all came together to make this a truly memorable brunch. 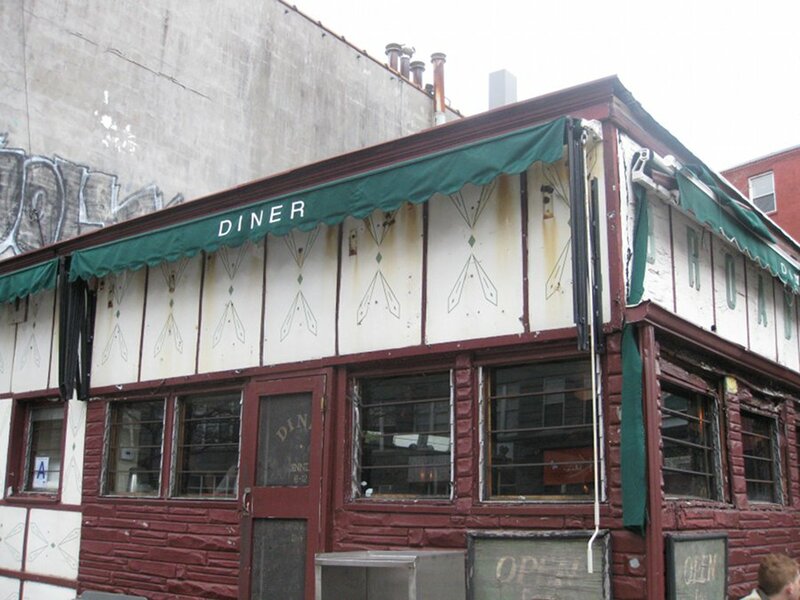 If you find yourself in NYC, Diner should be a place on the go-see.